What fighter-mage combination do you like best? That was my point, you can't abuse the game with the rules I play by. That is why I don't care about it. You can only cast one simulacrum at a time so no you can't infinite cast timestop in my game and you can't use multiple planetar's or other high level summons like the druid's elemental prince. You can't use spell scrolls with projected image or simulacrum to get infinite casts of protection from magic or timestop ect. If I were to abuse the game like that I wouldn't see a reason to have optimized melee damage at all because a pure class mage would gain those abuses the earliest and you could take your time using infinite timestop with any combination of spells to kill anything in the game. Kind of defeats the purpose. No, but you can still cast TimeStop many more than four times. Your rules do allow a simulacrum to cast it. Unless you are talking about houserules? Yeah a simulacrum at high level could give you more timestops with your fighting ability cut down to 60 percent. A FMT can cast simulacrum too and he has access to his HLA's as well. Yes, but then we come back to number of castings. A dual can cast Simulacrum far earlier in the game and far more often than a FMT. Your taste in what you call abusive is probably where we differ. A dual at level 9 levels so quickly that he is equally good at casting as a pure caster in the endgame. But he is much more sturdy in the early game and the fighting ability still adds a lot of power, even in the endgame, no matter how hard you 'abuse' spells. TOB introduced critical strike and while many bosses are immune, you would surprised how many enemies are susceptible to critical strike. If they can be hit with CS then they can be hit with backstab as well. LOB mode more than triples the HP of all enemies in the game and SCS further doubles and triples HP on top of it. The advantage of massive multiplier damage cannot be overstated here. The theif's traps are the equivalent of being able to cast multiple timestops and dragon breath spells before for the battle and watching them go off one after another while you run around with a X10 damage multiplier before enemy defenses can come up. In comparison a Berserker mage would have to spend rounds casting timestop and all enemy defenses would go up. He would start attacking much later in the battle and he would have a X1 damage multiplier but it wouldn't matter because he would have to spend his timestops debuffing enemies so they could be hit and then waiting between timestop spells for the defense to actually go down and then cast another timestop ect, ect. I might not be the best person to try and explain this but I'll give it a go. You did a great job explaining it. Thanks again, I learned a lot. My preference is generally the Fighter > Mage dual. The main reason is that I usually have these characters using ranged weapons and berserkers and Kensai have ranged weapon restrictions. 5 star proficiency in bows or crossbows is really nice. Berserker rage is great to be sure, but I find I hardly ever use it in practice. I think you can get different answers depending on whether you care most about endgame power, overall versatility, or getting 9th level spells as quickly as possible. Duals are way ahead in terms of getting 9th level spells quickly, but they're not as versatile as multis and suffer in the late game from losing fighter HLAs. FMTs are the most versatile and may also be the strongest in the late game due to thief HLAs, but never receive 9th level spells which may be an issue for mage-light parties. FM multis are somewhere in the middle, which can be a good place to be for those who want fighter HLAs without giving up on time stop and dragon's breath. I'm coming from a 6 person party perspective with a druid for summoning and two pure class mages for raw magic power. I focus 3 melee warriors on tank tactics and raw damage output. For me, on the hardest difficulties with enemy HP through the roof and all of the hardest elements like enemy caster pre-buff...I feel that I am cutting into the enemy before the battle can start sometimes. I am through enemy protections 3x faster and dealing 10X more damage per a hit in some situations. I can't think of any other class combo that can deal anywhere near that raw damage output other than a fighter/theif but FMT doesn't need help from another party member and even then the FMT has the magic protections and unique buffs that work with the thief class too. Using exploits in the vanilla game you can get away with all kinds of stuff but even then the enemy will take much longer to disable protections and way longer to deal the necessary damage to drain enemies with 500 to 2000 HP. Ultimately, the longer it takes you to kill your enemies, the more damage they will do to you and your party. It's much easier to keep all 6 party members alive if you are 10X more efficient at dealing damage and you can cut through enemies and disrupt casters before their instant protections even come up. I have my favorites for different game rules and party configurations. I actually prefer the Fighter/Thief because he is a pure damage oriented character and sometimes it just feels cheesy to add magic into the mix. In the end I think how effective a character is comes down to the difficulty, the mods, the party, the player's knowledge and even then it varies from fight to fight. The game has a variety of different fight setups that give each class an edge under certain circumstances. It really comes down to having fun in the end but if we are talking raw power on the toughest settings, you can't go wrong with any F/M combo or kit dual really. I prefer FMT and do feel that it edges everything else out at the end when the chips are truly down. Even when the FMT is at his weakest and the game is set on it's hardest, the FMT is never a liability at any point in the game. His ability to use armor, cast magic buffs and protections, use thief utility and special abilities with both fighter and thief HLA pools open and even some mage extra spell HLA's bonuses. The FMT is always useful and OP most of the time as well. i vote fmt even if i don't think that is the strongest build possible, i do it cause is the build that i prefer, the one that better suits to my playstyle and that can better perform the tactics i like the most. the strongest builds are kensai(9)->mage and berseker(9)->mage, at least for bg2 and tob. good fighters at the beginning, kensai needs some care to survive, short dual time and then they can hit hard using the mage's protections and buffs. as they gain levels their real power starts to show, as they get lev 9 spells. a mage with at least 2 lev 9 spells (3 if you don't allow scrolls in the clones quick slots) has infinite spells using the spell trap and a pi. in EE is still possible to use a version of the advanced infinite spell strategy that allows to have a pi and a simulacrum trough a chain contingency, it does not need preparation if the correct spells are memorized and can be pulled out in a fraction of a round if rov and aop are used. a lev 9 dual at high level can pop out projected images 1 after the other all day long if he wishes, and a pi with the correct equipment needs only the time to cast improved alacrity than can protect itself and unload the spellbook, time stop is not really needed. out of combat the dual can use the spell trap and pi to memorize again the stoneskins, pfmw, ih and other buffs so he never runs out of them, he can mlee and be effective while fully protected, but this is the lazy option as the really powerful one is to use his terrific arcane power, so terrific that trivializes the game no matter what mods are used (afaik...). the strongest mlee build is fmc, a fmc fully buffed gets 2hp/cleric level bonus, mage and cleric buffs and protections, thaco and dmg bonuses and 25str without using crom (so an other party member can use it), he rolls also maximum damage. best offensive buffs and best defensive ones without relying on other casters. he lacks apr as he can not get gm and can not use speed weapons, but gww is the solution when is needed. holy power, rm, duhm, staff of the ram and gww while he is completely immune from physical damage and magical attacks make every boss really easy. Like the triple class for versatility, getting HLA goodies from Fighter AND Thief, which the Berserker ->Mage Dual loses. I also like to run a party featuring Super-Tank Aerie plus Keldorn and Yoshimo/Imoen [w/ Jaheira as long as Insect Plague is a handy Ace-in-the-hole]. ******* as added feature for TOB. Mostly I seem to enjoy playing the game more with a multi-talented character and I get a kick out of fooling around with Setting Traps as a change of pace. Closet Corps of Engineers-type, I guess. Planning and logistics have always been a part of Military History I want more of. The idea of not fighting battles until you have already won [a la Bruce Lee, Sung-Tsu] has always appealed to me. @the_sextein Actually BBoD does 2d12+5 damage even if description doesn't say that. Since it grants GM it also means additional +5 damage versus profficiency +2. Also in proper comparison should be compared against 22 strength belt at least so 4 damage difference from CF. Evil characters can easily boost their FM streangth to 22 without belt (18 +1 tome, +1 lum, +2 hell). In which case FM will use belt of skillful blade for additional flat bonus of 10% slashing damage. So it does about the same damage as CF on a character with 22 strength and it does less damage if the character is weaker. Either way, it's a spell and it requires a limited level 9 slot. Similar to casting to get an extra 2 attacks with an inferior offhand, I find it requires more wasted energy on spells that result in inferior results. The FMT is a more concrete damage dealer and I would rather use CF than cast a spell and then have to rest every time it runs out. Even if a character can get 10 APR with greater whirlwind and maintain a 25 strength with casting buffs, you can't use critical strike or backstab with a dual class fighter mage or cleric. The FMT is doing seriously 10X more damage a round than a cleric, or any fighter mage combo. 10APR X 2 critical strike X 5 backstab. No class can compare to the brute force output of a FMT and pure class mages will be better at casting high level spells than any multi or dual any day of the week. No high level spells will match the raw damage output either. The FMT will simply crush enemy HP faster than anything in the game and that makes it the best defense as well because your enemies will have less time to damage your party. Fights will end faster, your team will be more efficient and powerful. It may not matter on lesser difficulty settings but at the toughest this game can be...7X-10X HP boosted enemies with superior saving throws, the FMT stands at the top in the end. Timestop traps go off before contingencies can get off so your enemies are naked and mislead lets you backstab every attack with critical strike enabled and a natural 10APR with a +4 to hit bonus while your enemies are sitting ducks. Nothing can compare. FMC can use the lev 8 simulacrum and if he is of enough high level the simulacrum can easily reach 25 str while having the RM long lasting kai effect and having a BBoD scroll in the quick slot. so the simmi will get the GM from the sword, roll every time 24 for the 2d12 +5 proficiency +5 bonus weapon damage +14 str + bonus from braciers or other source. he will hit for about 50dmg/hit with really good thac0, even if is level drained compared to the FMC. 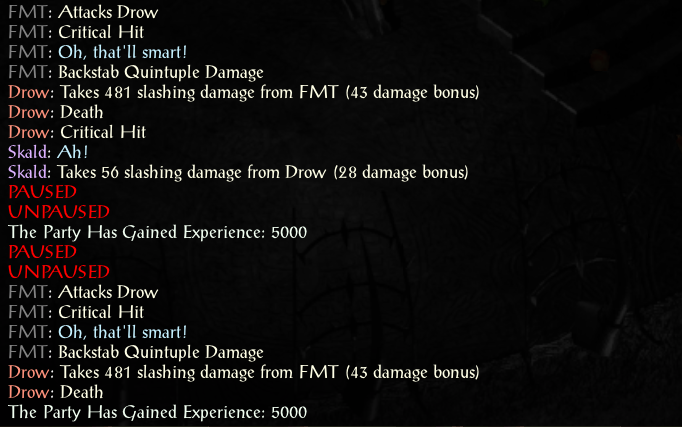 if the simmi has lev 13 he hits 8 times/round while dw and improved hasted (FMC can not have a +1 apr weapon in off hand). 9 apr if the +1/2 gbraciers are used. and the scroll is not wasted, he can do it every day of the week as long as he has lev 8 slots not used (no reason to use them for other spells). this hitting every possible enemy while the FMT can not use his assassination or backstab on some the most dangerous enemies. this while the FMC himself, with his buffs and DW FoA and a good mace, hits for 8 apr slowing the enemy, disrupting casters trough stoneskin and adding tons of damage to the one his clone does. all this while crom is available for an other party member so you can have 3 fighters whit 25 str at the same time, 4 if the other fighter uses the helm or is some class of FM himself. i have no doubt about the FMC being the best user of the spell BBoD. even aerie's clone is impressive with it but she lacks the apr of a GM fighter. @the_sextein I think your math is off. Unless mine is . Numbers from my excel do match my in game numers. Just checked moment ago to be sure. So average non critical per hit damage from CF is 29 versus 33 from BBoD factoring all the self buffs. This excludes additional 10% from belt of skillful blade for slashing damage of BBoD. 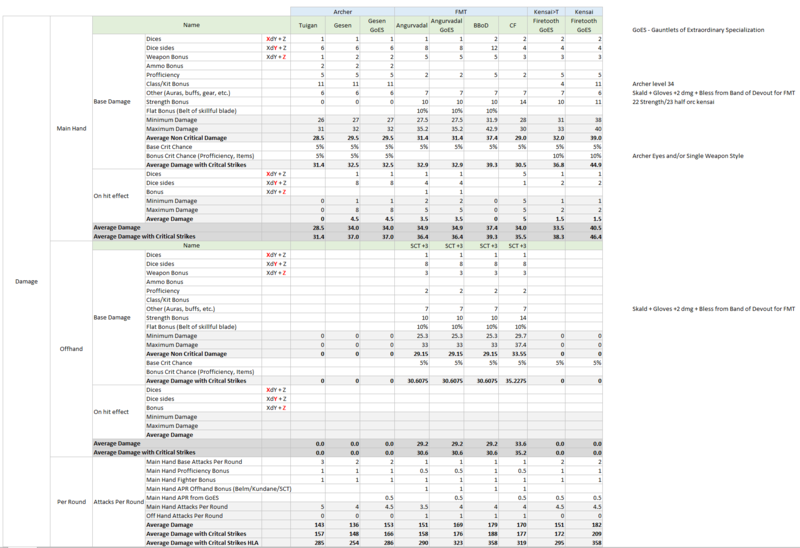 I'm not saying BBoD is better or anything, just wanted to outline actual numbers. As to FMT I do also think it's the strongest character in the game if mislead is in play. With headband of the devout you get 25 strength and max damage roll (righteous magic) which means you consistently hit 48 damage per swing with BBoD. Headband also gives permanent bless so +1 to damage roll and if you have gauntleds for +2 damage and bard for +4 damage then you consistently swing at 55 damage per hit on 10 APR. This means over 200 damage with non crit backstabs and over 400 with crits. Massive stuff. Over 4000 damage in a round on targets not immune to criticals and backstabs. You may be correct. Your chart looks right. 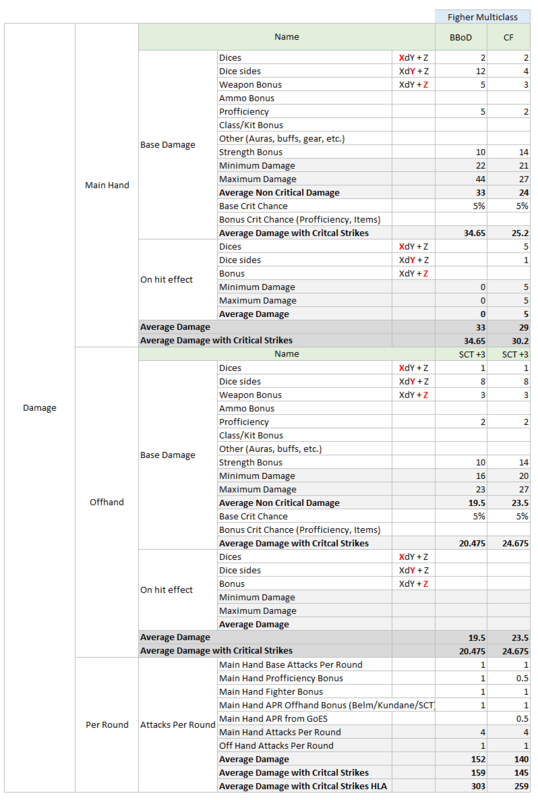 One thing though, is that CF is boosting the strength damage and to hit values on your off hand attack 2X every round for additional damage per round and it makes your off hand hit everything with ease very reliably. In the end I don't think BBOD does more damage per round and if it does, its by an insignificant amount. Either way, CF doesn't destroy loot, can't be dispelled and doesn't require any utility. You can get it as soon as you leave the underdark and you don't need spell slots to utilize it. I don't have a problem with BBOD but I prefer to use CF. Similarly my FMT had a -16 AC that was item based so it couldn't be dispelled thanks to UAI. -29AC was possible with magical buffs. I had -12 thaco main hand and -10 off hand with +3 or greater weapons in both hands at 10APR that require no spell casting. All APR, thaco and damage is item based, undisspelable and requires no buff (minus improved haste which goes for all classes). Using the CF/scarlet combo, you will have instant destruction of golems and trolls with stacking poison damage + electrical damage for casting disruption. CF also has two handed sword combat range. Regarding simulacrum. A FMT thief can use it. My FMT had 3 level 8 spell slots so you can double up the 10X damage if you like. Since the FMT has his timestops tied to his HLA's vs his spell slots you can get away with a bunch of extra timestop traps using the simulacrum as well. the level loss from simulacrum will effect your limited level 9 casting slots and you will find that it has a much less restricting effect on your FMT HLA abilities. You will have two characters with crom frayer doing 25 strength critical strike double damage 10 times a round or you can switch out CF for two characters with 22 strength doing 2x critical strike + 5X backstab damage, 10x a round. (pure destruction) Have them pop some strength potions and they can both push that combo with 24 strength for maximum damage possible in the game. Both also have access to assassination for quick and dirty destruction. I use CF for my main hand and scarlet in my off hand but I have spectral brand as a secondary main hand for backstabs. It does serious damage, can summon an extra morty sword and has a special ability that will boost thaco by 10 points, insuring that all backstabs land with a nice speed factor. It also grants negative plane protection, hits as a +5 enchantment and does 1D8+5+1D6 cold damage(caster disruption through stone skin). The headband of the devout is a very nice idea that I wasn't using previously. It's only once a day for a round but it would be a superior alternative to drinking strength potions at least for a single round. Strength potions will last for entire epic battles or even multiple battles so it's not a game changer but I will keep it in mind on future runs. i don't run the game with the last updates, my version is v2.3.67.3 so this maybe has changed. if a F/M cast BBoD while having in off hand CF he retains both the 25 STR and the OH attack, if he un equips CF is not able to put it back again, but as long as is there before the BBoD is created he is DW it and CF. he may loose the extra attack of a +1 apr weapon, but as he have GM from the BBoD spell he gets 4 apr, even if multi, and a further one using the +0.5 apr gauntlets, so 9apr while improve hasted and obviously 10 when GWW, even if probably CS is better with that combo. this is true, but only in some situations, as yourself point out. 1. the FMT can not cast from spellbook BBoD, this mean that he can use the combo only wasting each time a scroll, and there are not much in the game, or he can use his simulacrum, and this changes the things. 2. headband of the devout grant only 1 RM/day, more than enough for a party that rests often. the simulacrum clone solve also this problem. 3. when the party reaches this point of the game a lot of enemies are immune to crits and some of the most dangerous ones also to backstab. really effective, but on foe that can be easily killed in other ways. in judging the overall power of a toon i prefer to see how he can deal with the really difficult enemies, not how fast he can win minor battles. 4. mislead + back stab is surely one of the most powerful things that can be done in the game, something, like multiple mislead clones singing the bard song when it was still possible, that i personally do only for testing or if i want to have some fun in a moment that i am bored, usually then i reload and fight the battle without it. imho it spoils all the fun of playing a backstabbing rogue, he does tons of damage to enemies that are not even aware of him and can not retaliate. i regard it as dropping fireballs in the FoW, the lifeline of the novices, an easy and lame tactic that i prefer to leave to who is not able to fight the enemy in a fair way, giving them a chance to react and retaliate. BBOD isn't better than CF in any significant way so a FMT has no reason to use it. By wasting CF on your offhand and a level 9 BBOD spell with 9APR you will do about 40 points of damage more per a round for a limited time IF the enemy is immune to both critical strike and backstab. The FMT with 10APR and no exploits will be within 40 points of damage ALL THE TIME and do more damage when BBOD is not active, the FMT doesn't need to sleep after each encounter and can explore naturally. On top of that every mage in the game can be backstabbed including Irenicus. The 5 at the end of Ascension are all susceptible to backstab. The Oasis, the fire giant lair, most every enemy in watchers keep are all susceptible(minus a few boss encounters). 95% of your enemies will fall prey to it. In those situations the FMT is doing 10X the damage of any other class. On LOB mode your average mob is 5X to 10X HP so the fights take that much longer and there are no minor battles. Even if you are doing 10X damage the fights will last as long as they do on Insane mode with any other class that fights at 10X less damage than the FMT. Add in SCS pre buffing and the FMT timestop traps become a huge bonus on top. Using the headband of the devout will last a turn and then it's gone. Using simulacrum doesn't change this unless you are going to cast a huge supply of them by exploit just for that extra point of strength and max damage. I guess if you don't mind casting a group of clones with the item it could make a significant difference but it seems like a stretch to me. Using SCS rules you can't use more than one clone at a time anyway so it's not possible for me. I think it will come in handy in some situations where you need a lot of concentrated brute force on the highest difficulty settings but I don't see myself trying to exploit it at the power levels you have at that point in the game. Either way the headband is not usable by any FM combo other than the FMT. This thread isn't about judging peoples skills or tactics, it's about what FM combo is the most powerful and the answer is obvious in my opinion. I beat the game on insane with SCS and Ascension using a vanilla fighter. I don't need to use mislead and backstab to beat the game and I find your closing comment to be unfairly judgmental. There is a difference between a novice who can't beat the game without using a single tactic he found on the internet vs a master who can beat the game any way he wants and when it comes to being the most power gamer class possible he uses all fair tactics available to him for maximum benefit. Using a mislead spell to maximize backstab results is less cheesy than casting 12 clones and using a one shot item from the EE that still results in less damage output than a FMT with 10APR backstab. And you are correct in doing so (using CF since overall its better). I always compare mainhand with offhand. CF is not far off BBoD. Only reason to use BBoD is for x5 backstab really, I don't think it's even remotely close in any other scenario. Especially since crushing damage is so much better overall. 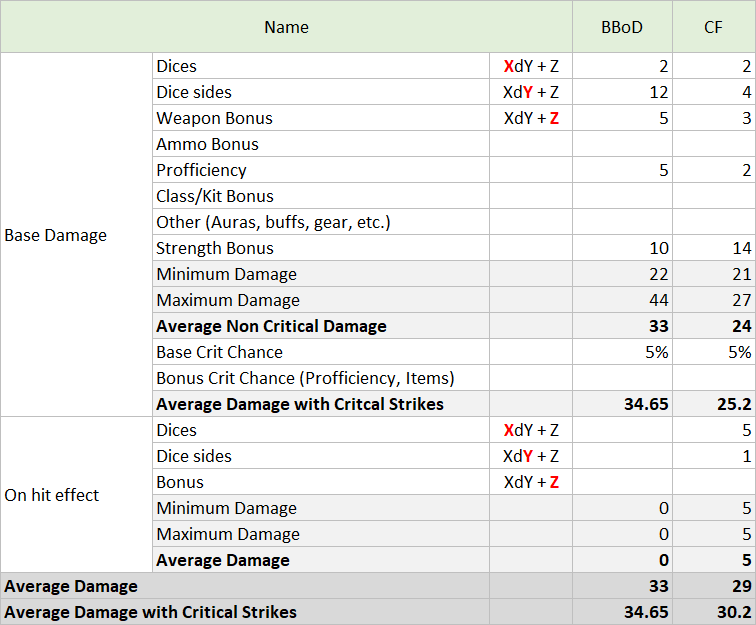 Only way for BBoB to 'win' damage with significant margin is by having max damage per hit (kai/righteous magic) and with critical strikes because of his higher max damage roll. It's one turn actually so just like normal RM. Quite handly and lasts long enough to be useful for long fights. In my playthrough I don't think many fights last longer than a turn and I play purely on LOB. I meant 1 turn I swear! hehe, yeah it's a nice option I hadn't considered. I'm going to use it on my current playthrough but I think you will find on LOB mode that towards the endgame many fights last longer than a turn. Still, you can pop a potion of strength after it's effects where off if that is the case and you will be fully optimized. Especially in watchers keep. Thanks for the charts, going to check it out. This is my 4th full trilogy run on LOB/SCS with Ascension. They are mostly one turn except fights that enforce long fights via mechanics (sendai, yagashura, big 5, etc.) or undispellable PFMW spam (I'm looking at you kangaxx). I always bring archer which I think overall is the most consistent damage dealer in the game. Simulacra 10 APR critical strikes at -26 Thac0, even with -11AC bonus in 2.5 patch enemies get hit 100% of time. And let me don't start on how OP smite is on archer. But that is topic for different day. Sorry, I forgot who I was talking to. I thought you were someone else I was talking to earlier. Thanks again for the charts and the tip. Being that the headband was an EE item I overlooked it. Only thing I can think of to add is that your charts are comparing FMT builds with BBOD and scarlet vs CF and scarlet, and not comparing them to the other FM multi and dual combos. Scarlet is only usable by FMT based on the class selections available in this thread. Otherwise you are going to have to cast spells for temporary off hand ability to hit with belm and it will be with an inferior weapon. Scarlet does 2-6 poison damage that stacks on top of the 1D8 +3 damage which adds more damage to the equation. This gives the FMT using CF and Scarlet even more overall damage potential vs a FM or FMC that can't use Scarlet Ninja-to. Giving up the speed weapon for an offhand weapon that will hit can give more passive abilities but it will sacrifice 1 APR which will keep everything about equal in the end. Overall a FM with BBOD and belm at 10 APR would need to cast spells to boost offhand enchantment and even then it would be within 5 points of damage on average to the FMT with CF and scarlet=no BBOD or enchantment spells. A FMC with BBOD and CF would not need to cast for off hand enchantment and BBOD would gain the CF strength bonuses for an additional 36 point bonus damage per round. Subtract a single off hand attack with scarlet and once again the FMT is within 5 points of damage without the need for level 9 spells and the added benefit of being able to use critical strike and backstab with 10APR when possible. He also gains two handed sword range, golem and troll destruction on 8 of his 10 attacks and a higher to hit probability with his off hand. Yep it was caption issue. I was comparing to FMT only anyway as I used it for my current playthrough. Also interesting if you switch out your main hand weapon for spectral brand the belt of skillful blade adds a 10% bonus to your 1D8+5+1D6 critical strike backstabs for some more juicy damage. FMT won't be using BBOD very much since he relies on scrolls to utilize it. Combining that with max damage from the headband and it's brutal. This thread isn't about judging peoples skills or tactics, it's about what FM combo is the most powerful and the answer is obvious in my opinion. if i was judgmental i apologize. this thread is about what FM combo is more popular, not more powerful, i gave my vote to the class i prefer to use (FMT by the way), not to the one that i consider more powerful. also nothing in the OP post tells that LOB and SCS should be the ground on which we have to compare the combos. i admit that playing a really hard setting like that needs "special means", still i don't like the mislead + backstab combo cause the enemies can not retaliate if they don't see trough invisibility. 95% of your enemies will fall prey to it. In those situations the FMT is doing 10X the damage of any other class. the same reason that make it so awesome for you make it not interesting for me. but i don't play SCS and don't play LOB, i play tactics mod and other old ones, different settings need different means. still this is a generic thread on the fighter/mage class combinations are the most popular, so your own settings can not be the only ground on which the different combos shall be compared. Using the headband of the devout will last a turn and then it's gone. Using simulacrum doesn't change this unless you are going to cast a huge supply of them by exploit just for that extra point of strength and max damage. I guess if you don't mind casting a group of clones with the item it could make a significant difference but it seems like a stretch to me. Using SCS rules you can't use more than one clone at a time anyway so it's not possible for me. a FMT can cast 3 lev 8 spells at top level so 3 simulacrums, that last 17 rounds so little less than 2 turns. every simulacrum using the headband of the devout and a BBOD scroll can fight 16.6 rounds with the weapon, 0.4 is needed to cast it and 10 of them with maxed damage roll. as the FMT is also fighting. the clone can also have timestop scrolls in a quick slot. this can be done 3 times/day without spending nothing but the lev 8 slot. i am not talking of using multiple clones. what is wrong in it? again i am talking of using a single clone, where did you got the idea that i was talking of multiple clones? i told "mislead + back stab is surely one of the most powerful things that can be done in the game, something like multiple mislead clones singing the bard song when it was still possible" but the use of multiple clones was referred to a bard, so not a F/M combo, and is no more possible also in vanilla EE, you don't have to play SCS to have it nerfed. A FMC with BBOD and CF would not need to cast for off hand enchantment and BBOD would gain the CF strength bonuses for an additional 36 point bonus damage per round. Subtract a single off hand attack with scarlet and once again the FMT is within 5 points of damage without the need for level 9 spells and the added benefit of being able to use critical strike and backstab with 10APR when possible. BBOD gives GM that multi can not have on other ways, GM gives +0.5 apr so BBOD+CF gives the 25STR bonus loosing only 0.5 APR from CF+SNT(belm). also i see no reason to give CF to a multi that is also cleric, that can make his STR 25 so many times/day with his own spells (wondrous recall gives 2 more RM on top of the DUHM and RM he normally has), imho there is surely some one other in the party that can make better use of CF as is better to have 2 toons with 25 STR than one. FMT won't be using BBOD very much since he relies on scrolls to utilize it. Combining that with max damage from the headband and it's brutal. again his simulacrum can use scrolls without wasting them, i fail to understand why you assume that the real toon and not the clone should use the scroll. simulacrum doubles the effectiveness of every F/M, simulacrum make possible to use a single scroll every time, FMC's simulacrum can be really effective even if does not use quick slots as his own boosts can compensate the level drain. Yeah, ok its "what you like best". I guess I got on the topic of liking the FMT because it is more powerful and the conversation has been geared in that direction for a long time now. At least when people have been speaking at me. I am cool with people playing however they want but if we are talking power...well you know what I think. LOB isn't a mod but I will admit that I don't expect everyone to use SCS. If we are going to talk about difficulty though, SCS limits you from using infinite scroll exploits with simulacrum and that causes a difference in what we consider acceptable and it changes the balance of power. Not much else to say about that. My point about the headband is that is a very limited use item and it's common to see people say "but infinite clones with infinite scrolls and items" I'm not going to judge anyone for how they want to play the game but I don't play that way and if I am going to discuss powerful characters and party combo's it will always fall back to that same argument which gets tiring to be honest. If you are using a single clone that can use the headband then that seems fine to me but that clone is cut down in levels and it's only going to work for a single battle. If you adventure through a map and get in 3 battles with a few small fights on top the headband is only going to work for one of those fights unless you are holding back your main FMT the whole time. It looks to be a nice item and I have not utilized it so I can't comment with any authority but I'm willing to bet using a simulacrum doesn't make it a free for all which is what I was getting at. in your setting scrolls can not be used by clones, is true, but afaik the headband can (i can be wrong about it). so when you say " If you adventure through a map and get in 3 battles with a few small fights on top" i answer that the FMT has 3 lev 8 slots so can have a clone using it in each major battle. the FMC clone does not even need the headband. and why " unless you are holding back your main FMT the whole time"? the FMT (or FMC) fight side to side with his clone, we are not talking of PI that freezes the mage. as LOB + SCS is the setting you use and like is natural that you prefer what works better there, for you power is everything or you would not use a such extreme setting. i use an other playground, tactics with average stats charname and without max hp leveling up, that i suppose is quite milder than yours. so i don't look to the maximum power possible, my fun is in playing each battle many times with different tactics, like once without casting, an other time only casting, an other only ranged attacks and on and over. my goal is to test all the possibilities that a given party has. so i prefer what works better for me.